Too hot for sea turtles? Turtles left out in the cold? green turtle populations in the Great Barrier Reef. Rebecca Scott examines the oceanic routes of loggerhead turtles using satellite telemetry and ocean models. 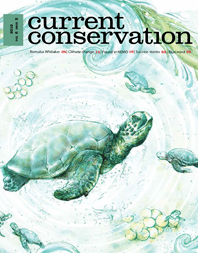 Jack Frazier asks the critical question: what constitutes success in conservation? contributed by Smitha Shivaswamy and George Supreeth (Pencil Sauce).